Finding one or two homemade dressings that you enjoy and keeping them on hand will facilitate easy meals that taste flavorful and fresh. Moreover, making your favorite condiments from scratch will likely offer cost savings and reduce the amount of additives and preservatives otherwise consumed via store-bought versions. 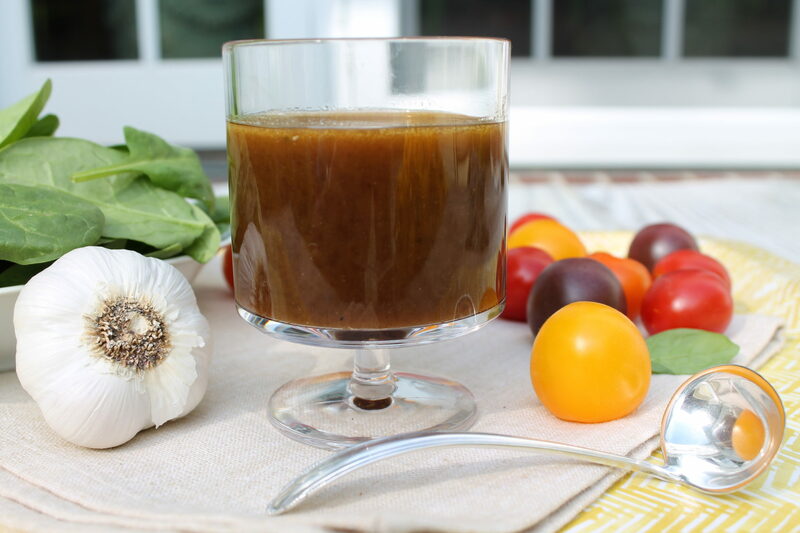 This balsamic vinaigrette is a great “basic” to keep on hand. Perfect for easy green and pasta salads as well as grains like quinoa, I love this dressing with a combination of feta cheese, tomatoes, cucumbers, yellow bell peppers, and a hearty dose of sunflower seeds. However, the flavors pair equally well with summer fruits like berries or watermelon, or fall and winter staples such as apples and pears. Try tossing leftover roasted vegetables with your favorite greens or cooked grain and a drizzle of this vinaigrette, and it’s rather tasty on a beet salad with feta or blue cheese and walnuts. Lately, I have started using this vinaigrette as a marinade, too. For the recipe for Grilled Balsamic Chicken with Tomato Feta Salsa, click here. 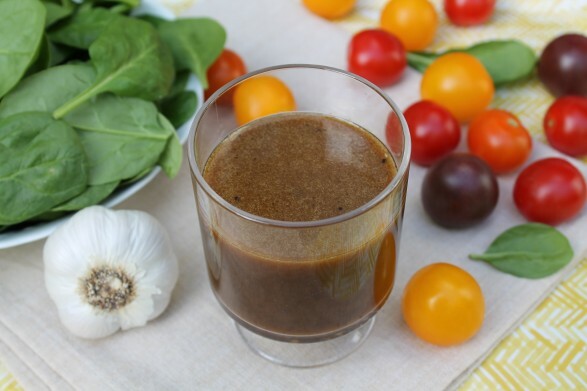 The following balsamic vinaigrette is a year-round staple that I recently discovered to be a flavorful marinade for chicken. We enjoy the recipe as is, although for a tangier kick, I have occasionally swapped one tablespoon of the balsamic vinegar with one tablespoon of red wine vinegar. In a bowl whisk together the garlic, salt and pepper, Dijon, honey and balsamic vinegar. Drizzle the olive oil in a slow, steady stream, whisking as you go, until the dressing is emulsified. Cover and refrigerate for a couple of hours to allow flavors to blend. Will keep several weeks in the refrigerator. Shake well prior to using. For an easy marinade, add a quarter cup of the dressing to each pound of chicken and refrigerate overnight for maximum flavor. Grill or bake and then top with chopped tomatoes, feta cheese, a bit of basil, and an extra drizzle of the vinaigrette, if desired. I often want something like this for my cucumbers, tomatoes and onion salad. This should be perfect, Mary! I do hope you like! Check off another favorite!!! It is in our house too. Blend this recipe in the blender.. yummy.. It absolutely would be, Helen! I like Paul Newman’s oil and vinegar dressing but like many bottled dressings, I find it too salty. I have found that adding a small amount of brown sugar (to taste) helps. Regular sugar is too sweet. Am making Jack’s salad tonight! The tomatoes this year are awesome!! Thanks for sharing your tip, Judy, and I hope you enjoyed the salad recipe. The tomatoes sure are delicious right now! Hi Ann! This looks amazing..going to make some up tonight..
Ann – This is now a favorite in our house too! I love your column and website. There are still a lot of recipes that we need to try. Thx! Thanks for the kind message, Tina…so glad you like this one! Ok, so I *finally* got around to making this salad dressing….what have I been missing!?!? I love it!! The consistency is just right and it achieves a nice balance of flavors. Thank you. This is now my go to balsamic dressing, made from easy pantry ingredients! So happy to read your comment, Alexis. Thanks for letting me know and glad it’s a keeper!